This issue of Medical Clinics, Guest Edited by Drs. Scott Kahan and Robert Kushner, is devoted to Obesity Medicine. 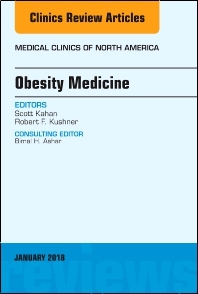 Articles in this outstanding issue include: Obesity as a Disease; Treating Obesity in Primary Care; Obesity Guidelines Overview; Obesity in Special Populations: The Elderly and Aging; Obesity in Special Populations: Young Adults and Adolescents; Obesity in Special Populations: Pregnancy and Peri-pregnancy, Including Epigenetics; Nutrition in Obesity Management: Cornerstones of Lifestyle Management; Physical Activity in Obesity Management: Cornerstones of Lifestyle Management; Behavioral Medicine and Counseling for Obesity; Obesity Pharmacotherapy; Medical Devices for Obesity Treatment; Bariatric Surgery for Obesity; Weight Maintenance and Long Term Management in Obesity; and Case Studies in Obesity Medicine.